The HTC Desire C has the same eco-friendly packaging as the One series phones: a rounded foam box in a sleeve of paper. The phone comes with a standard microUSB cable for charging and transferring data, a set of headphones and a wall charger. It has the Beats Audio technology, but HTC didn't throw in a Beats headset - it would've been a ridiculously generous bonus to a 200 euro handset. Still, the standard set in the retail package has decent sound. HTC haven't bundled a memory card either. 4GB of built-in storage should be enough to get you started but a card will soon be a necessity. At 107.2 x 60.6 x 12.3 mm the HTC Desire C is superbly compact and shaped for a perfect had fit. It's a tad larger than an HTC Explorer or a Wildfire S but we don't think anyone would mind, considering the bigger screen. What we love about the Desire C is the fact that it fits a bigger 3.5" screen in a package that's visually smaller than 3.2-inchers like the Legend and the Hero. It's also super lightweight at just 98 grams - which also contributes to the comfort of handling. The HTC Desire C looks like the One X designers worked on it on their own time. Viewed from the front, it's a miniaturized version of the HTC flagship. Around back is where the differences start to show. Of course the entry level Desire C cannot match the finish of the One X - it's mostly the different feel and lesser resistance to smudges. The color accents are different too - the back of the Desire C reminds us of the HTC Sensation XE, with the red trim around the camera lens and the beats audio logo. For the most part, the HTC Desire C is made of plastic, but we like the subtle metallic frame around the screen. The back cover is rubbery for comfortable grip but it does tend to get a bit grimy - nothing though that a good wipe won't handle. The Desire C may not have the premium feel of the One series but the compact size and neat styling are definite points in favor. The red outline of the lens and the microUSB port are nice accents and the phone's inner body and the battery come in matching color. Popping the battery cover open reveals the red-painted innards - something we saw in the HTC Aria a few years ago, only in yellow. The HTC Desire C is available in three different colors: red, black and gray. Gone are the funky HTC Explorer colors for a decidedly grown-up look. The Desire C will do for the business hours too. The earpiece is traditionally placed in the center above the screen. The proximity and ambient light sensors are in the screen bezel nearby. The Desire C hasn't got a front-facing camera, which could be a deal-breaker for some. A notification LED is also missing. Below the screen is the usual set of three capacitive buttons - Back, Home and Task Switcher. Their white icons are always visible but it takes a tap of the screen to light them up. The keys are small but well-spaced to be comfortable to use. They also vibrate on touch. There's nothing on the left side of the phone but the microUSB port. It's placed near the bottom and serves both charging and computer connections. It's easy to spot thanks to its red lining. The right side houses only the volume rocker, which is prominent enough to locate by touch and solid to press. There's a 3.5mm headphone jack at the top and a power/lock button, which stands out with its metal finish. It's quite a slim knob that needs some getting used to but the trick is not to try and push the button itself - you can barely do it by anything but a nail. The bottom of the device features only the mouthpiece. The back of the Desire C is very grippy, with a nice rubbery feel to it. The 5MP fixed-focus camera lens is centrally placed at the top, with nothing but the loudspeaker next to it. There's no LED flash. The HTC logo is prominently engraved in the middle of the back cover. Undoing the back panel reveals the cool-looking red plastic innards with a regular-sized SIM card compartment and a microSD card slot. The 1230 mAh Li-Ion battery is red too. 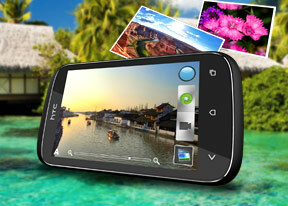 The HTC Desire C features a 3.5-inch LCD display of HVGA resolution (320x480). It's not the best display by any means, but you do get what you pay for. The bigger 3.5" screen stretches the resolution a little thin and the viewing angles are not particularly good. We've definitely seen worse though. Colors are okay, but the overly reflective screen and low contrast aren't doing them any favors. Considering the price tag though, it's an overall okay display. We put the HTC Desire C through our usual display tests and here's how it scored. You can find more about the testing procedures here. 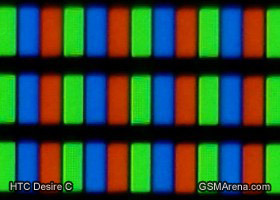 We snapped a shot of the display under a microscope and here's what the RGB matrix of the HTC Desire C looks like. The HTC Desire C looks good and approaches the low-end market with the right attitude. In terms of build, there's little the HTC Desire C doesn't do right. It's a bit thick for its diminutive size but anything slimmer would probably have been a lot less comfortable to hold. Don't let this put you off though. We think the Desire C feels great in the hand and the fact that it's extremely light helps a lot too. The red design accents are subtle but effective in a package that isn't trying to impress aesthetically but looks straightforward and reliable instead. So far so good. Now, let's see what the Desire C can offer in the software department with the Ice Cream Sandwich treatment HTC has given it.